Whilst I wait for modelling materials to turn up on the door step, I needed something to do. When going through my garage, I came across an old wardrobe base that I put away for some reason or another. Hmm, this would make a great shunting plank. Having a look through some boxes, I came across a few 2nd hand points and track, I have enough for a layout. This will also utilise my older Hornby rollingstock (plastic wheels) and Hornby/Lima locomotives (pre dcc). So, the design. As with most shunting puzzles, space is the key and the sidings should only hold a certain amount of wagons. This is the plan, quite simple, but should allow some operating interest. 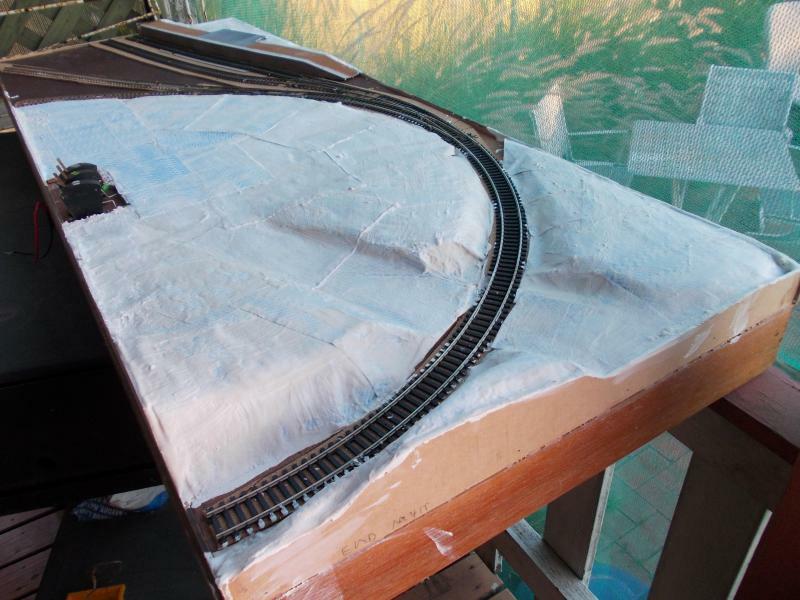 The points on the layout are 2nd hand Set Track, except for the curved point and 2 x 2nd radius curves, which was originally bought new for Jacks Corner. The rest will be 2nd hand flex track and a few old small curves. This will make laying quite quick. I may have to make a small extension off the cuved end, pehaps a small sector plate. Wiring will be a simple affair, dc, wired to all sidings with a insulated section at the end of the platform. I have an old transformer/controller which I pulled out of the storage. The points will be simple rod in tube method, again, quick to install. Motive power will be an old Class 29, Class 27 and an old Triang DMU. Rollingstock will (as mentioned above) be my older plastic wheeled four wheel stock, ie, 2 x Cattle wagons, 2 x louvre vans, 3-4 open wagons and an old brake van. 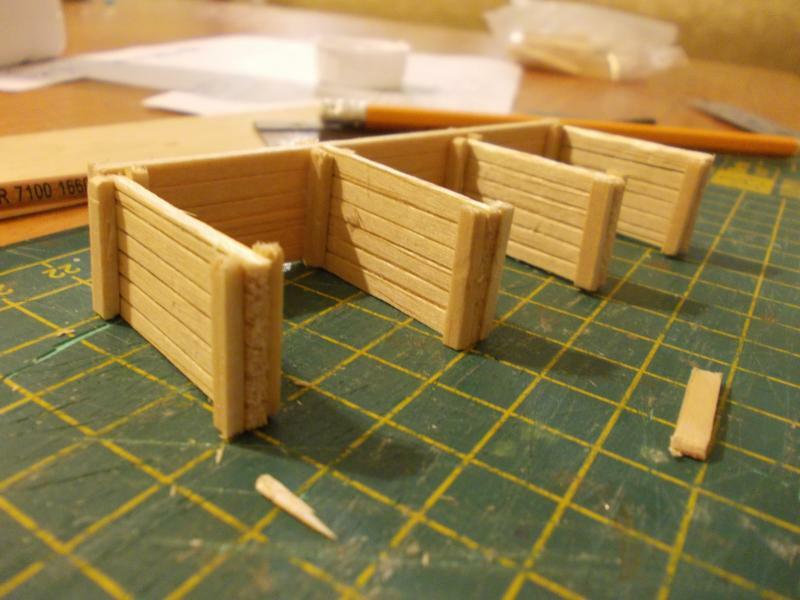 Structures on the layout will be easy. The station building is an old Hornby building (platform shelter), goods shed will be an extended Scalescenes freebie, signal box made of card and Scalescenes paper, Ratio windows, coal staithes made of balsa and a cattle dock out of card covered in Scalescenes brick paper, as with the platform. 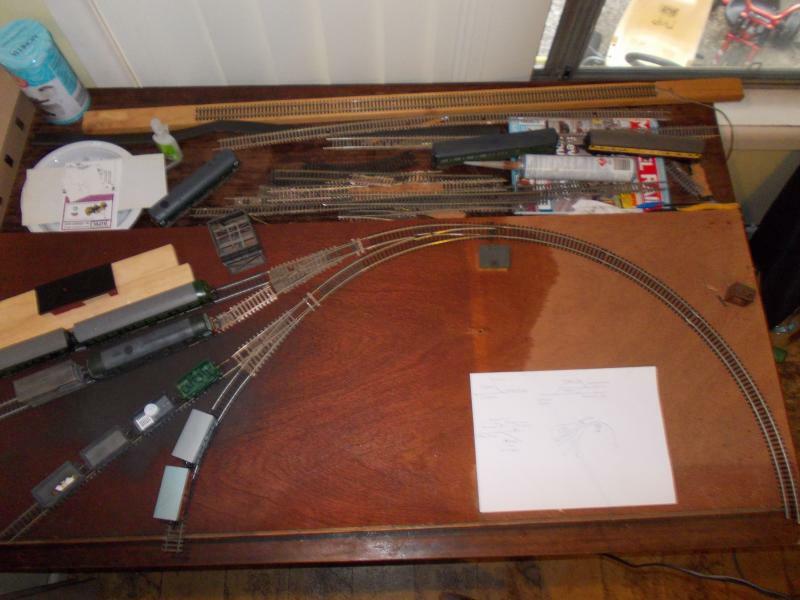 This picture gives a better idea of the overall size of the layout and the length of the individual sidings. The DMU is as far as it can go into the platform road. Toady I gave the base board a clean up, I had to remove the big grey greasey mark on it so that cork could be stuck down on it to progress with track laying. Once cleaned, track laying began. All up there were 12 pieces, a mix of flex and set track. As mentioned previously, the points are operated by wire in tube, and I needed a way of holding the points shut/closed as the two small set track points do not have any centre springs. 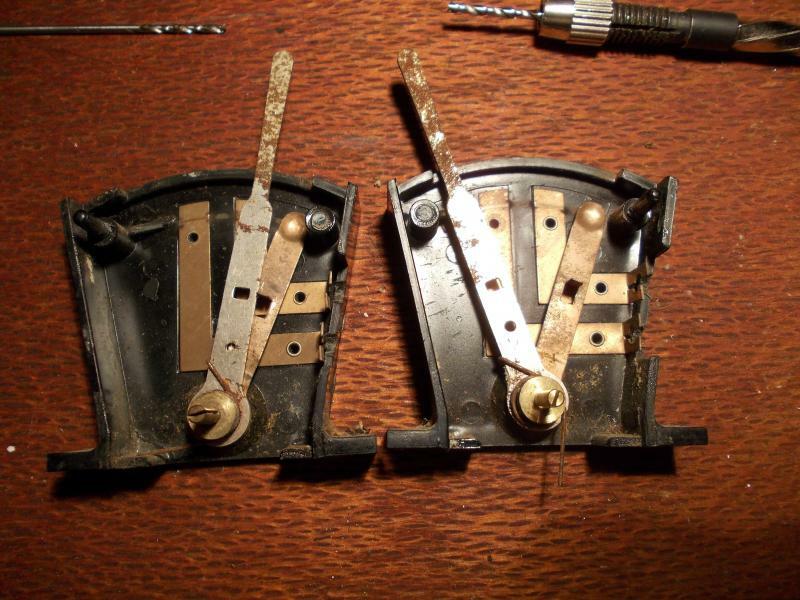 This is where three old Hornby switches, (the old lever type to operate solenoids), come in handy. As these can be locked in at one end and released under spring compression at the other, they were an obvious choice (as I have 20-25 lying around). First up was to open them, so I could reveal the inners. Ofcourse I broke the studs that hold these together, but not to worry as the whole switch will be glued shut once finished. Once opened, I could drill a hole through the switch level/handle. 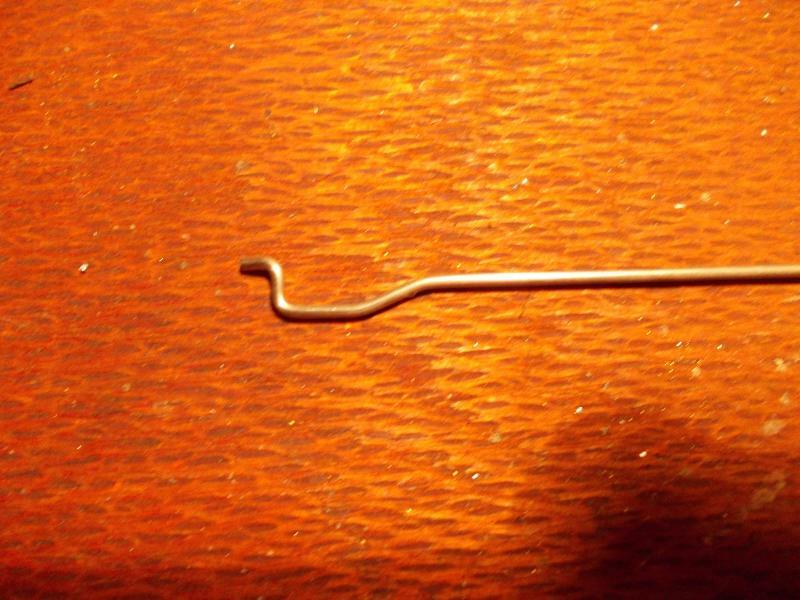 The copper stricker (strip with raised top) is to be removed as it isn't needed. The switch on the left has a pilot hole drilled (above copper spring), whilst the switch on the right has a 1.3mm hole drilled through to accomdate the wire push/pull rod. Next was to bend up the welding rod to fit the lever. The 90* S is then fed into the hole in the lever. To centre the wire for the outlet, the 40* S bend was made, so that the wire feeds easily through the switch body, using the lower electric plug socket. This was then installed into the lever housing. Next up is to bend the wire downwards via another S bend, so that the push/pull rod is at baseboard height. The copper stricker has been cut and can be seen here, on the lower right hand side of the lever arm. 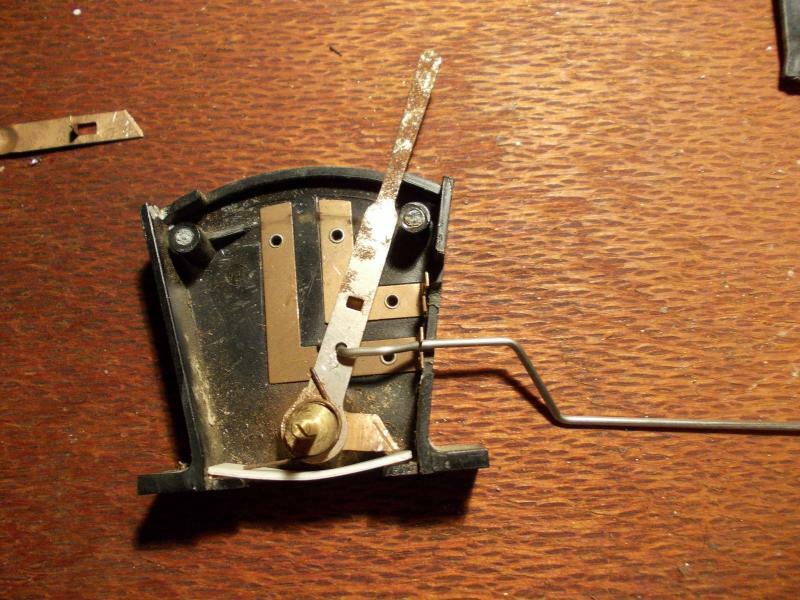 A piece of styrene has been added to this switch to stop the spring wire from coming out. 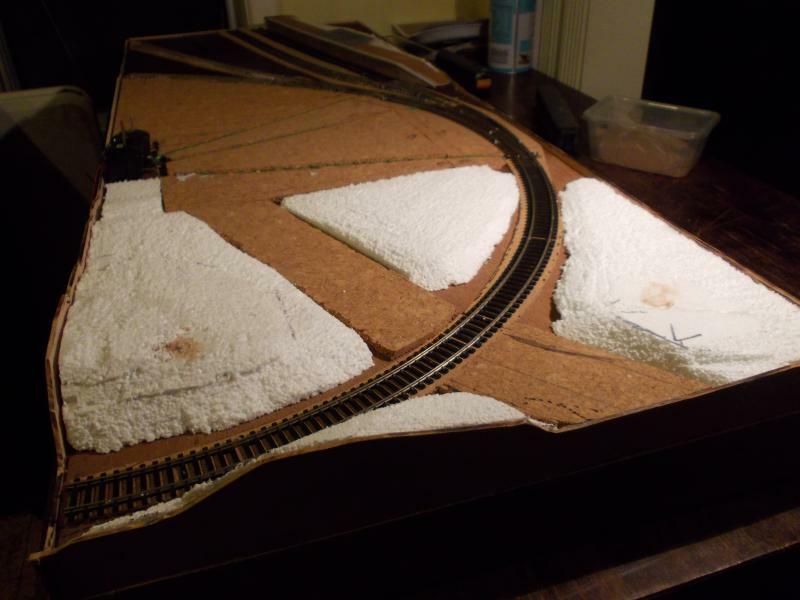 All done, now to glue the lid back on, then place onto layout. The track was all positioned and pinned down. The points were hooked upto the levers which were screwed and glued to the front side of the baseboard. Next up were the electrics. Each piece of track was wired in. The wires returning to two lentghs of 2mm copper wire, basically a bus wire, which is screwed to the underside of the baseboard frame. Holes were then drilled through to connect up to a controller. The platform road has an isolated section along it at the furthest end. This is simply one on/off switch connected via the + power supply. Train direction is controlled by a switch within the controller. Point levers installed on the baseboard, The push/pull rod runs through drinking straws to the points, simple and effective ! The isolating toggle can be seen behind the levers. Track all down, wired, and everything operates accordingly ! Would they control electric signals if you wanted those Gary?or is there too much weathering. Thanks for sharing the shunting plank with us Gary. It,s of particular interest to me as I have an interest in shunting. I can't believe the speed and ease with which you progress these things. Most people have one layout which is hard enough to keep going but by my calculations, you must have at least three. Far too much time on your hands. Max, thanks, This is something to play with when I'm between modelling Kelly Bray. Reg, yes, the switches would still be capable of switching electrics, but also manual signals the way I have used them. Ofcourse, you would require a few crank arms etc to get to the signal. There are signs of rust on the lever and that seems to be the only 'weathering'. Toto, yep three, but if you include the shunting puzzle utilising old Hornby Super 4 track in the garage, thats 4...! 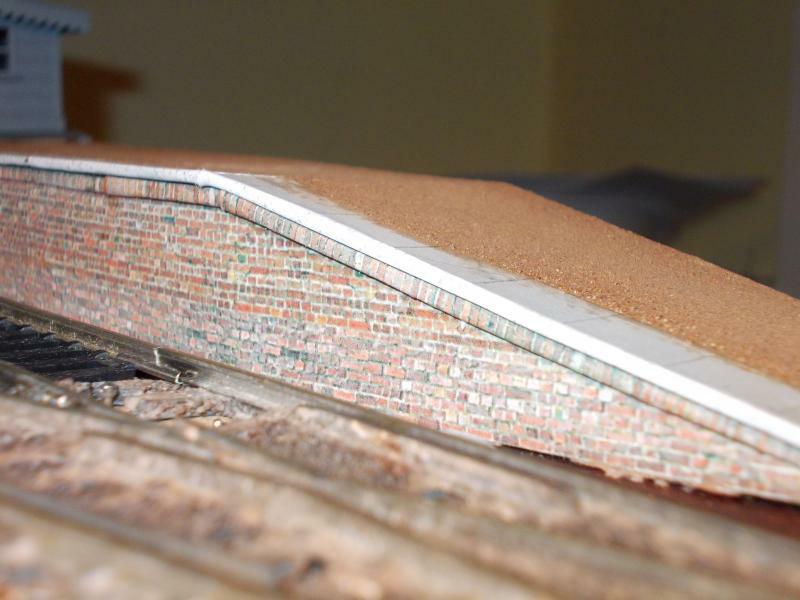 Platform made of card and covered in Scalescenes 'aged brown brick'. Have to finish off the coping on top of the wall before capping of with edge stones. A small tarmac area will be included under the canopy, the rest of the platform being fine sand/deco granite. I have completed the platform build this morning, which included the top finished surface. I chose to include a header course of bricks on top of the retaining wall, before putting the edging slabs on. Above. The platform with all surfaces complete. It just needed time for the PVA to go off under the fine soil, before giving it a shake off. Below is a cruel close up of the brick header course under the edging slabs. The soil has dried and the edges have been exposed to show the edging slabs. Whilst this was drying I gave the platform shelter (seen above on the left) an under coat of grey primer. I will allow 24 hours to dry before attempting any top coats. Next step was to decide on the landscape. 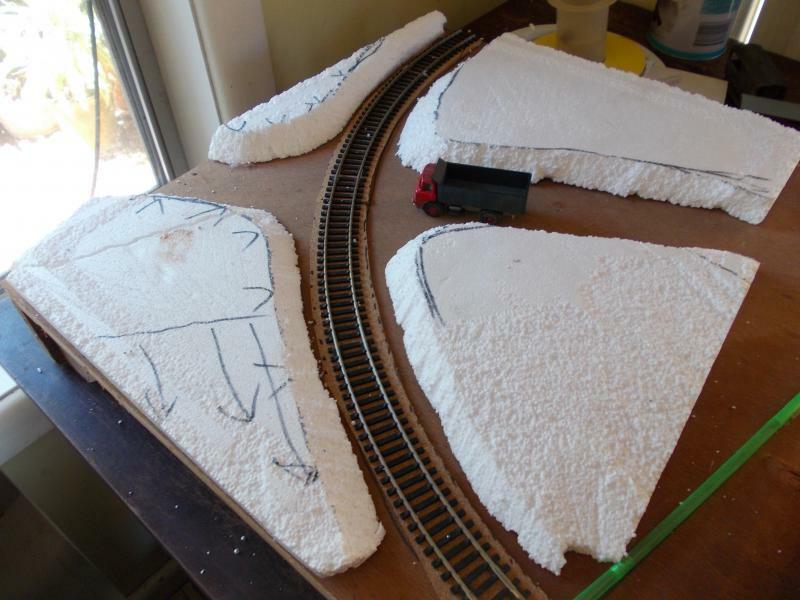 I want to include a cutting and railway crossing, so it was out with the styrofoam to see what would fit. 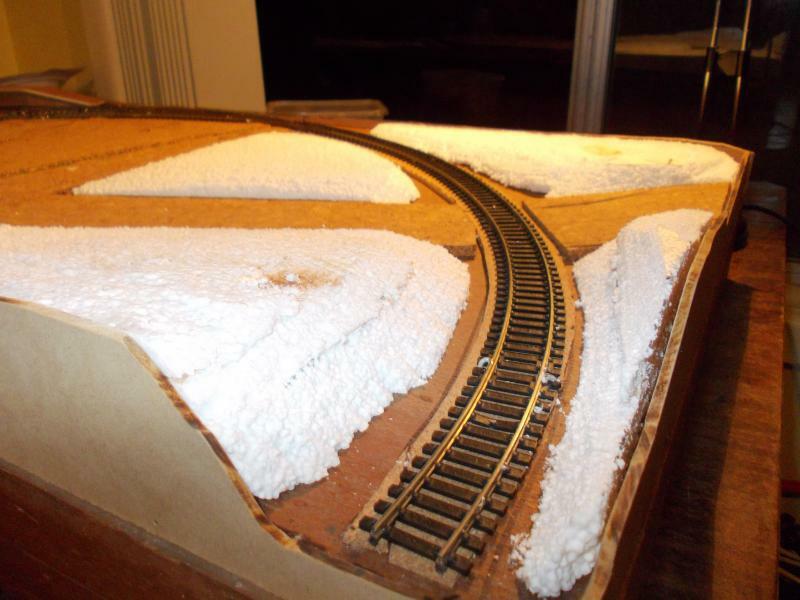 To do this and maximise the piece of styrofoam (only 500 x 350mm), I first pressed it down onto the layout firmly, so that the rails would create an indentation into the base. This gives me a better idea where to now cut the styrofoam and to what shape. The outside was first up to cut. After indenting, flip the foam over and mark a line approximately 20mm back from the outside rail. This is the cut line. Once cut, I moved to the inside and done the same process, mark and cut. As can be seen below, I have drawn on gradient lines to assist in fine tuning (carving) the landscape. This was all filed down to shape using a wire brush and a hacksaw blade. The next area to be carved out is behind the platform area. The pic below shows the carved styrofoam in place and the placement of the platform itself. 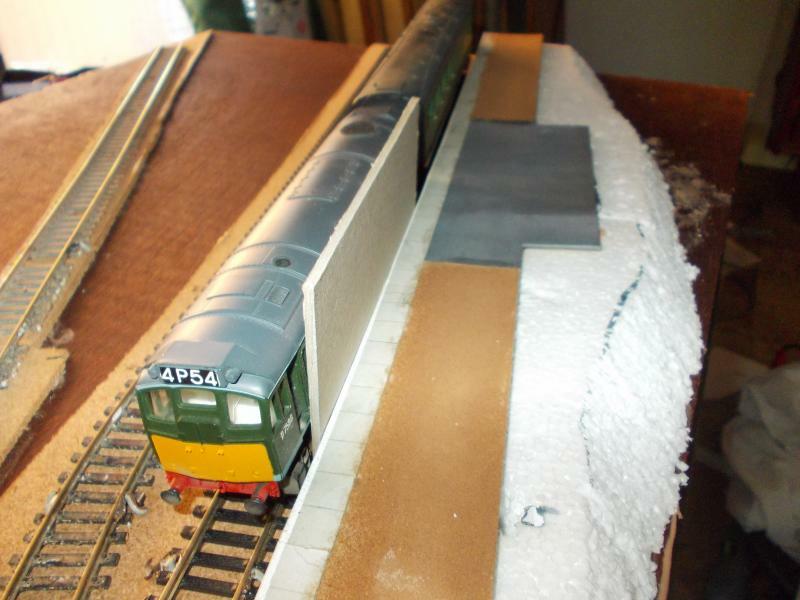 The 3mm card is a gauge, set between the rolling stock/locos to give adequate clearance, whilst glueing platform in place. To make the filling in between the point rodding simple, I cut up two old 6mm cork floor tiles. 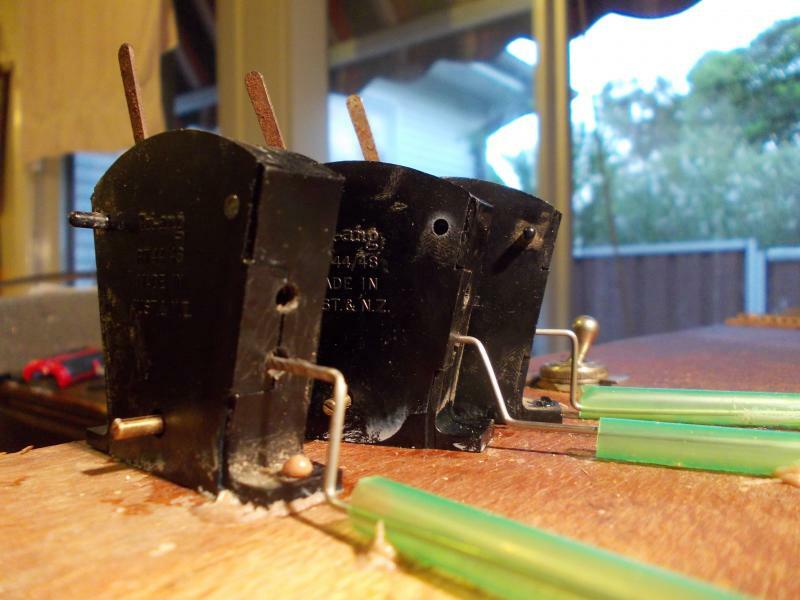 These were glued into place, directly onto the baseboard using a cheap version of 'liquid nails'. The only thing left to do now is to tidy up all the edges. 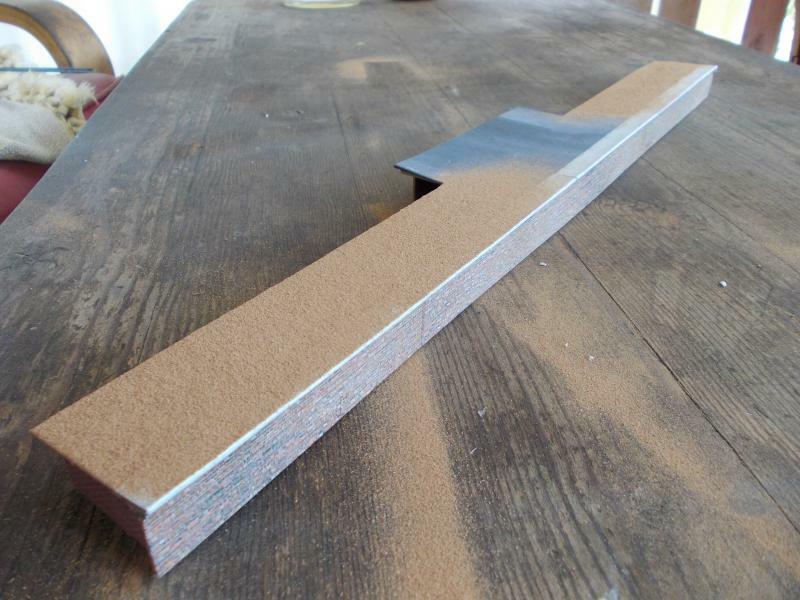 As the baseboard edge is now various heights, the whole outside edge was treated with 3mm MDF. Pieces upto 65mm in height were placed around the edge and a marker pen was used to trace the final land formations on the inside. I made sure I gave an extra 3-4mm to protect any landscape detail. 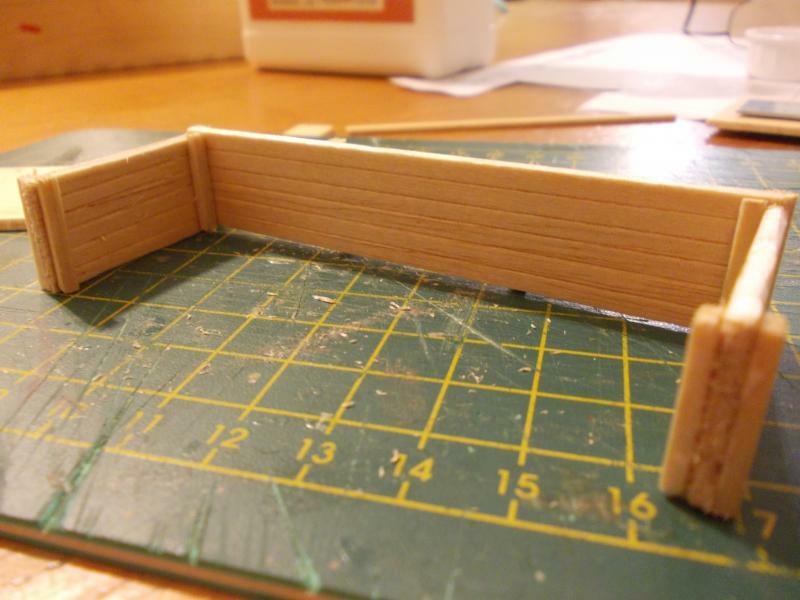 The MDF was cut, glued and nailed to the baseboard edge. Lucky that the board was recessed on the frame itself, which helps with the finished item. Completed land formation. Cork is also used to build up the roadway. Another view of the carved styrofoam landform base. The 6mm cork works a treat as it brings the road surface up to rail height. Perfect for a crossing ! Anyway that's it for tonight and it's back to work tomorrow. 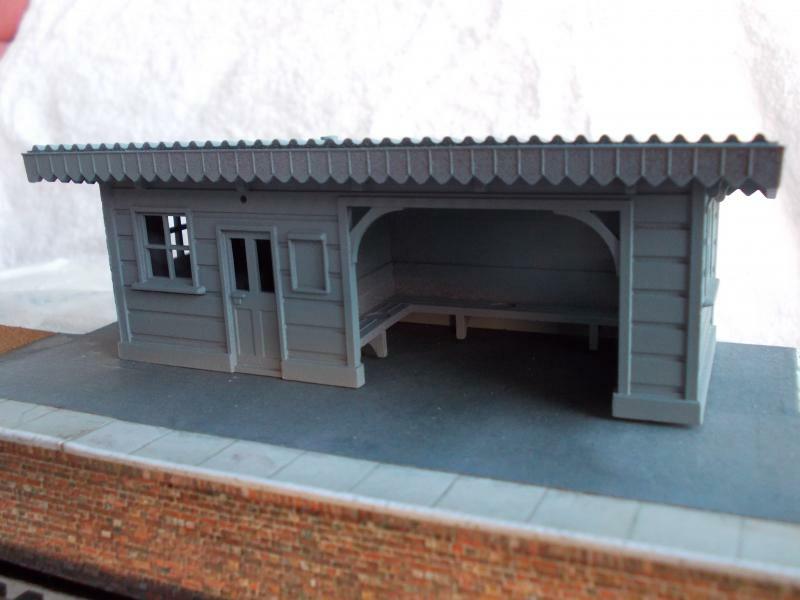 Hopefully tomorrow afternoon I can get on with the plastering and either painting the platform shelter or building the goods shed and cattle dock..., hmmm, decisions, decisions ?? Rome wasn't built in a day. It's a pity that you weren't site foreman on that job Gary! Nice work so far. Can you throw some light on the platform shelter please? Super glue does on your fingers. I know what you mean though, I have some pva on the scenery thats still a bit sticky after a week, although it was put down fairly thickly. I'm old, that's why I'm allowed to change my mind, when I can find it. 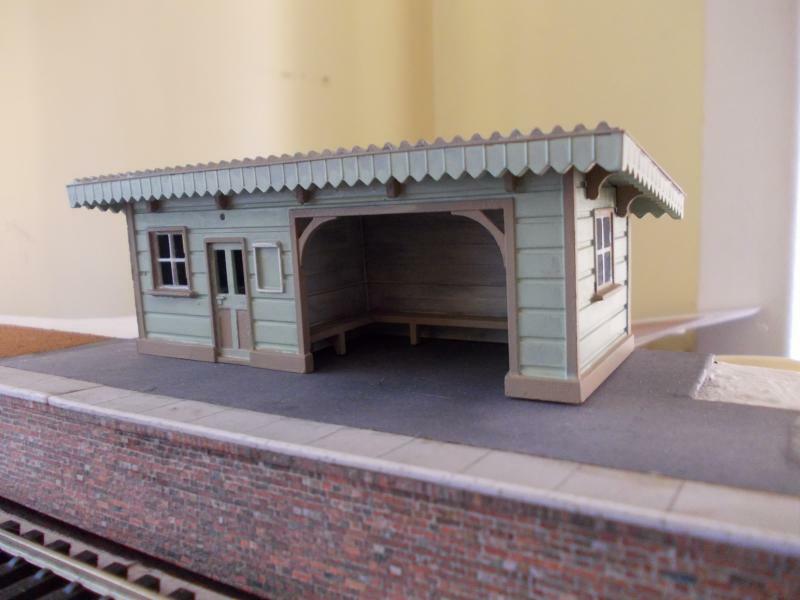 The platform shelter I am using is an old Hornby type. I purchased two of these (without platform) some time ago for a few dollars. Once painted up, it should look ok and fit into the scene quite nicely. It will get its first coat of colour tonight. To make painting easy, the roof section/valance comes off. This afternoon, the layout recieved its first layer of plaster. This is only a base covering. I have used those cheap disposable washing up cloths (Chux ? 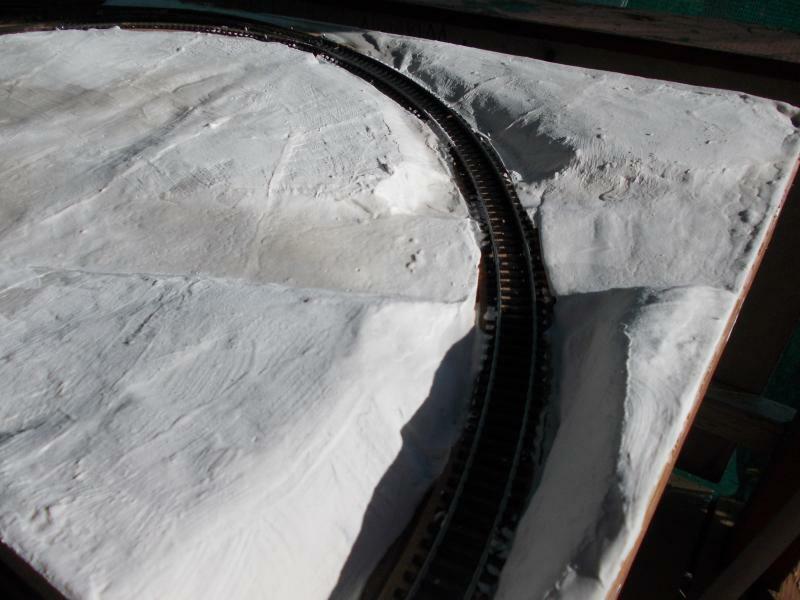 ), dipped into a plaster/water/PVA solution and laid over the styrofoam formation, down to the track, over the cork, and also behind the platform. Adding the PVA to the plaster mix will hopefully strengthen the base and make it less brittle. Tomorrow, it will recieve the second coat, after allowing a good 24 hours for the first layer to set hard. This second coat will hide all those niggling little layers caused by the cloth underneath and also have more texture put into it to create some better looking ground scenics. Coming on Leaps and bounds. Must be one of the fastest builds I've seen yet. You make it look so easy. Hey Gary that's great mate. And you have added some very simple idea's that are very useful. Pictures and explanation's are superb. Just think what you can achieve when you retire. I have completed the second plaster coat, which hides most of the cloth ridges. 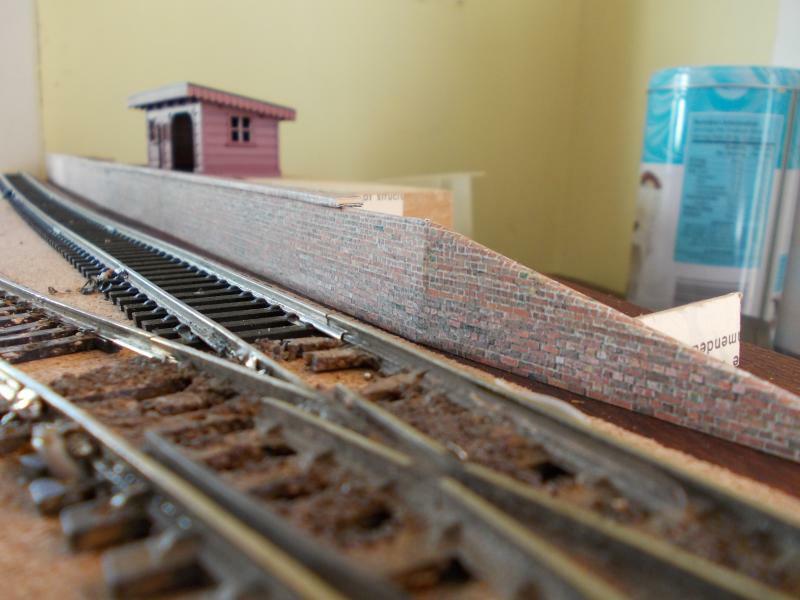 I mainly wanted to hide the ridges where the road and structures will stand (signal box/ground frame and cattle dock. A light sanding of the road surface will be necessary after this coat has dried thoroughly (tomorrow). Looks good Gary. When you get bit between your teeth you really get motoring. All the shelter needs now is a snogging couple and it will be great. Gary, you really need to stop dragging your heels and get on with this model! An inspirational "how I dun it" Gary. Well written and illustrated, keep it coming. Inventing liveries is seldom successful but you seem to have hit on a subtle winner there, watching with admiring interest! Mick - I may just have to purchase the 'snogging couple' ! I do have a few little people around somewhere, but not snogging..
Terry - One step at a time... got to walk before you can run ! Marty - I'll keep it coming, no worries. When I get to the scenics (greening) side of it, I wish to provide as much info as posible, especially with which materials I use. Doug - I did think about a light shade of blue originally, but I didn't want to have to mix colours down, as the blue I have would have needed tinting with white. I think the green will blend in quite nicely with the landscape. Similar colours to this were used on the railways in New South Wales and that where I got my inspiration from. The signal box/ground frame will be painted up quite similar. Might have to knock that up tonight..
Last night I built up a coal staithe. Quite a simple build, which only 2.5mm balsa wood was used. The walls were scribed at scale 9" intervals to form the planking. The total length of the coal staithe is 24' and the length of the side walls are 8'. 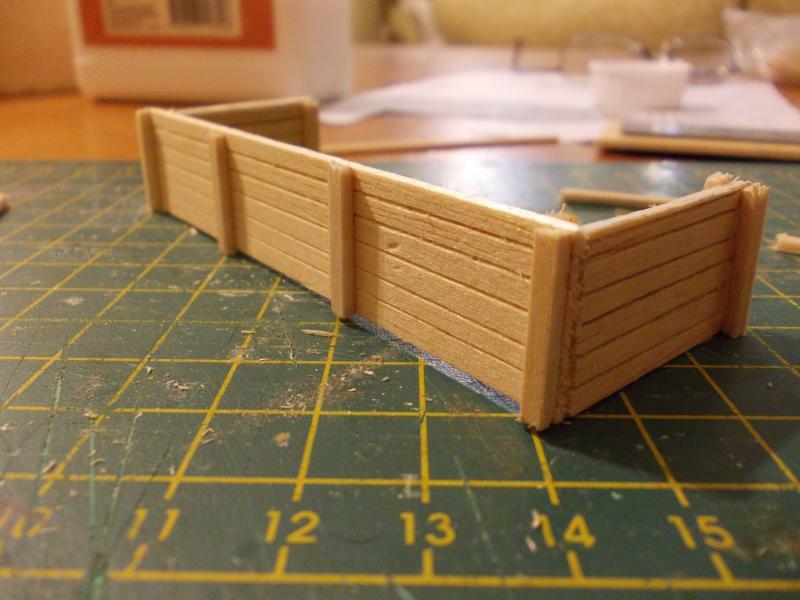 9" wide strips of balsa were cut to form the verticle posts and glued into the corners, on each side of the end walls and at 8' intervals along the back (rail side) wall. The bays were cut and scribed as the back and side walls. Each length had the vertical posts glued in place, then attached at the 8' intervals. Prior to painting, the horizontal timbers will be treated with a knife to create a warn in/weathered look, especially along the top edges. Painting will be done tonight, which will just be a wash/staining or two of weathered black. Once the scenery is near complete this will be installed and coal added to the bays. Today after work, I sanded the road reasonably flat and also some areas where structures will stand. A splash of thinned down acryllics was painted over the bare plaster. I chose 'raw umber' and 'burnt sienna' for the areas to be covered in flocks and static grass. For the road, I went for a thin wash of black to give a grey base. I could have stayed with the browns, but I haven't decided on what colour the road will be yet. The basebaord where the coal staithes and goods shed will stand was given a coat of thinned black as well. I would like to start on the flocks, grasses, bushes etc over the coming weekend. A fantastic thread. 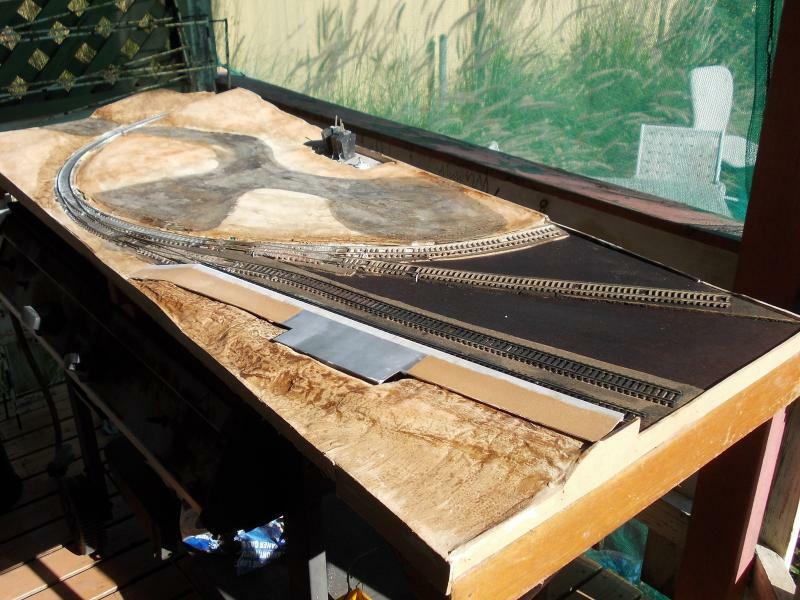 I'll be watching with interest for some landscaping and ballasting tips and progress snaps. 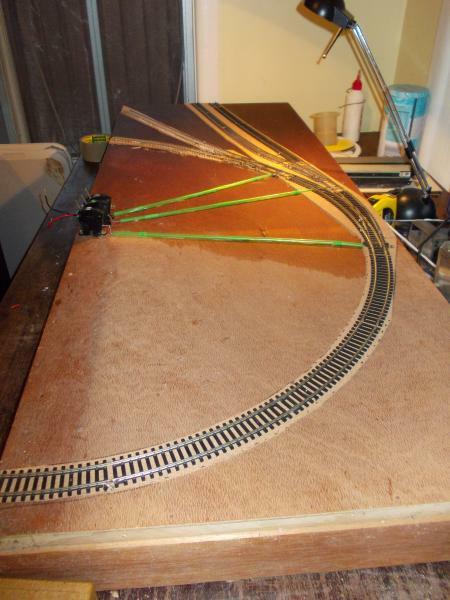 This is a great how to for someone who is happy to start off with a smaller layout as they could follow this step by step, not to much space required and relatively inexpensive as well. It also gets you up and running quickly which may suit some without the patience to labour over a bigger build.